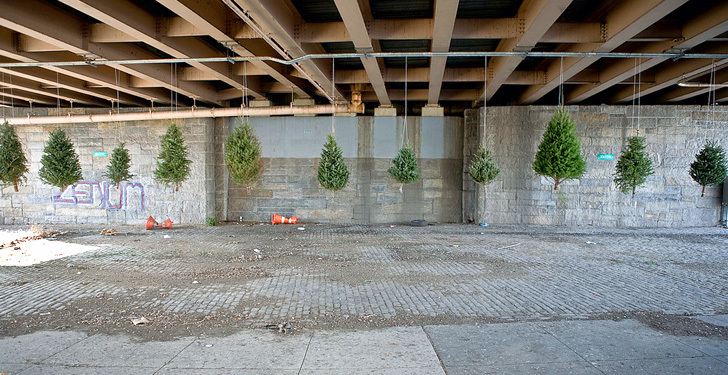 Last year, artist Michael Neff rescued more than a handful of Christmas trees from a sad, dried out, sidewalk fate by installing them as a pine-scented installation beneath the Brooklyn Queens Expressway. Set up at the highly-trafficked Metropolitan Avenue and North 6th Street, Neff’s installation infused some much needed greenery into the stark industrial site. Last year, artist Michael Neff rescued more than a handful of Christmas trees from a sad, dried out, sidewalk fate by installing them as a pine-scented installation beneath the Brooklyn Queens Expressway. Set up at the highly-trafficked Metropolitan Avenue and North 6th Street, Neff's installation infused some much needed greenery into the stark industrial site.